Explore two of the most iconic motorbiking routes of India on this 16-day itinerary that combines Ladakh and Spiti. You'll visit famous lakes like Pangong and Chandratal, travel to remote villages like Hunder and Chitkul and take on high-altitude passes like Khardung-La and Kumzum-La. En route, you'll stop to visit historic monasteries like Diskit and Dhankar to get a taste of the unique Indo-Tibetan and Buddhist cultures of Spiti and Ladakh. With powerful Royal Enfield motorbikes on hand, you'll roar through the barren mountains with an entourage of like-minded motorbikers and an experienced support team. Please note that price displayed is the per person price for a booking for one motorbike rider and one pillion rider. An additional refundable, security deposit of INR 10,000 per motorbike, not included in the cost displayed, is to be paid directly to the tour operator. This unique 16-day motorbiking trip gives you the best of both worlds, the Spiti Valley and Ladakh. Spiti, a cold desert mountain valley, sits at the intersection of India and Tibet. The valley is home to the most ancient monasteries in India, some of which date back a thousand years. Ladakh, the land of high mountain passes, is also the land of extraordinary beauty. The Ladakhi terrain, flanked by the arid mountains of the Trans-Himalayan range, is home to the most celebrated motorbiking route in India. Your adventure begins as you travel north from Delhi and enter the Spiti Valley, where you'll spend a week visiting villages from Hikkim to Tabo. You'll continue north from Spiti and enter Ladakh, where you'll spend another week visiting landmarks from the Leh Palace to the Khardung-La. You'll visit the state capital of Srinagar and return to Delhi, ending the tour with unforgettable memories. 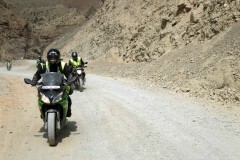 • Combine the two worlds of Spiti and Ladakh on a 16-day motorbiking trip. • Spend a night camping near the lakes of Chandratal and Pangong. • Get stunning views of mountains in the Spiti Valley and Ladakh. • Visit ancient monasteries like Key Gompa and Diskit Monastery. 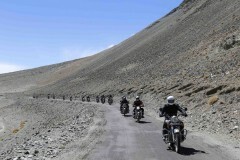 • Ride over high-altitude passes like Khardung-La and Chang-La. • Visit famous landmarks like Leh Palace and Dhankar Lake. • Travel with an entourage of motorbikers and experience exciting new adventures. The motorbike rider as well as the pillion rider is required to wear a helmet at all times while riding the motorbike. A safety helmet will be provided to the travellers by the tour operator. Travellers are required to carry a valid, govt-issued photo ID card and a valid driver's licence. 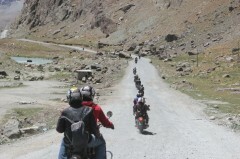 Travellers are required to follow all instructions of the road captain during the Spiti and Ladakh motorbiking trip. Consumption of alcohol and drugs is strictly prohibited during the trip. Travellers suspected of intoxication will not be allowed to participate in the trip. Travellers getting their own motorbike must ensure that the vehicle is registered to the rider's name and all the relevant documents (pollution check, insurance and driver's licence etc) are in order. For cancellation of the trip made by the tour operator due to any unforeseen circumstances: 100% refund. For cancellation of the trip made by the traveller after booking: no refund. In case of show: no refund. Travellers will be required to pay a refundable, security deposit of INR 10,000 per motorbike. Any major damage or loss to the motorbike and use of any spare parts will be deducted from the security deposit. This deposit is payable directly to the tour operator and any disputes involving the deposit will be settled between the tour operator and the traveller. Travellers are only allowed to store one rucksack in the support vehicle. Any extra luggage will be charged extra if stored in the support vehicle. If any traveller wishes to exit the tour mid-way for any medical or personal reasons, an additional charge of transporting the motorbike from the leaving point to the end point will be applicable. The tour operator reserves the right to alter or cancel the itinerary of this Spiti and Ladakh motorbiking trip due to any unforeseen circumstances to ensure maximum safety of travellers and staff. Costs arising due to such a change in itinerary will be borne by the traveller. No pick-up for this Spiti and Ladakh motorbiking trip. No drop-off for this Spiti and Ladakh motorbiking trip. Please ensure that vehicle is registered to the rider's name and all documents (pollution check, insurance, driver's licence etc) are in order. Arrive in Delhi and meet your fellow motorbikers. Your motorbiking adventure begins with a morning ride from Delhi to Theog. You'll ride through the cities of Panipat, Kurukshetra, Chandigarh and Shimla as you leave the plains behind and enter the mountains of Himachal Pradesh. Overnight in a hotel at Theog. Continuing forward from Theog, you'll ride your motorbikes to the distant village of Chitkul, deep inside the Spiti Valley. En route, you'll ride alongside the rivers of Sutlej and Baspa, enjoying scenic vistas of mountains in the Kinnaur Valley. You'll stop to rest in the town of Sangla, before arriving at Chitkul, the last village on the Indo-Tibetan border. Depending on time constraints, you may stop for the night at Sangla and visit Chitkul the next day. Overnight in a guesthouse at Chitkul. Ride north on the NH-5 and go deeper and deeper in the Spiti Valley. A mix of smooth roads and rough patches await you on the route. En route, you'll stop at the confluence of the rivers of Sutlej and Spiti as well as the town of Kalpa. You'll also stop at the Khab bridge to admire awe-inspiring views of Mt. Leo Purygal. By late afternoon, you'll reach Nako and visit the Nako Lake, depending on time constraints. Overnight in a guesthouse at Nako. As you continue riding from Nako to Kaza, the terrain begins clearing away. You'll see the greenery disappearing and the barren mountains of Spiti dominating the horizon. En route, you'll visit a string of ancient monasteries at the hillside villages of Dhankar and Tabo. Today's destination is the city of Kaza, the largest city in Spiti Valley. Overnight in a hotel at Kaza. A well-deserved break in on the cards after a 4-day journey through the mountains. You can explore the Kaza city or rest in your hotel room. Alternatively, you can also join the group in visiting local attractions near Kaza, including the Key Gompa, the oldest monastery in Spiti, the Hikkim post office, the highest post office in the world, and the scenic villages of Langza, Komik and Kibber. Return to Kaza by nightfall. Overnight in a hotel at Kaza. The most scenic of all routes, today's journey from Kaza to Chandratal Lake takes you along rough mountainous roads via the Kunzum Pass. On the way, you'll ride through multiple waterfalls that spill from the top of mountain cliffs and cross the roads on their way down. You'll camp at a short distance away from the Chandratal Lake and visit the calm and cool waters of the lake after a 30-min trek. Overnight in Swiss tents at Chandratal Lake. Today, you'll pass the town of Keylong, the capital of Spiti Valley, and begin riding towards Ladakh. Make sure to dress in layers for today since the temperature tends to drop on sections of the highway near the Rohtang Pass. You'll often see the Chenab River gushing alongside your route on the way to Jispa, a major halt point for motorbikers to Ladakh. Overnight in Swiss tents at Jispa. 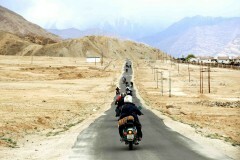 Ride from Jispa to Leh, the largest city of Ladakh. En route, you'll cross the More Plains, a vast stretch of flat land with breathtaking views on the horizon. You'll also ride through the challenging Gata Loops, a series of hairpin bends that require attentive motorbiking skills. Also on today's itinerary is riding through the second highest mountain pass in the world, the Tanglang-La. Overnight in a hotel in Leh. Spend your day at leisure in Leh. Today, you can head out to explore local attractions near Leh, such as the Shanti Stupa, the Leh Palace and the Thiksey Monastery. In the evening, you can also visit the Tibetan marketplace in Leh to shop for any souvenirs or gifts. Overnight in a hotel at Leh. Take on the challenge of riding through the world's highest mountain pass, the Khardung-La, at an altitude of over 17,000 feet on today's journey to Hunder. Located in the Nubra Valley, Hunder is famous for sprawling sand dunes and the Bactrian double-humped camels. Enjoy a scenic evening at Hunder and visit the nearby Diskit Monastery. Overnight in Swiss tents or a hotel at Hunder. Proceed to the Pangong Lake, travelling over an off-beat, rocky and rough route that will test your skills of motorbiking. You'll ride besides the Shyok River, taking in scenic views of the craggy mountains. At Pangong Lake, you can spend some time by the lake and enjoy the star-studded night sky. Overnight in Swiss tents at Pangong Lake. In the morning, spend some time on the banks of the Pangong Lake, visit the area featured in the popular Bollywood movie '3 Idiots' and travel back to Leh. Today, you'll cross the high-altitude Chang-La Pass, often layered with thick snow all over. Overnight in a hotel at Leh. Continuing forward from Leh, you'll take a turn west to reach the town of Kargil, a strategic and historic town in Ladakh. En route, you'll stop at the Magnetic Hill and visit the Pathar Sahib Gurudwara, an important Sikh house of worship. You'll also stop by Moonland, site where several Bollywood songs were filmed. Overnight in a hotel at Kargil. 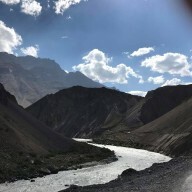 Head west on the Srinagar-Leh highway and ride through the tricky turns of the Zojila Pass and cross the village of Drass, the second-coldest inhabited village in the world. You'll also halt to visit the Kargil War memorial, dedicated to the soldiers of the 1999 Indo-Pak war. Driving past Sonmarg, you'll arrive in Srinagar by late afternoon. Overnight in a hotel at Srinagar. Depending on time constraints, you can visit Srinagar's beautiful gardens and the famous Dal Lake in the morning. Today's ride takes you from Srinagar to Pathankot. The route is primarily well-built national highways with a few sections of twisting mountainous roads. En route, you'll get to drive through the 3-km long Jawahar Tunnel. Continuing south from Srinagar over NH-44, you'll enter the green fields and farms near Pathankot. Overnight in a hotel at Pathankot. On the last day of your motorbiking adventure, you'll ride over a long stretch from Pathankot to Delhi. A long day of flat and wide national highways takes you through the towns of Panipat, Kurukshetra and Ludhiana, before reaching Delhi by late afternoon, where you'll return your allotted motorbikes and proceed to your next destination. Your trip ends here. Personal expenses like extra meals, beverages, apparel or gear etc. Costs arising out of unforeseen circumstances like landslides, road blocks, bad weather etc. Overnight in a hotel at Theog. Ride from Delhi to Theog. You'll be accommodated in a hotel at Theog. Today's meal package includes breakfast and dinner only. Please remember to carry a government-issued ID card and a valid driver's license. Overnight in a guesthouse at Chitkul. Ride from Theog to Chitkul. You'll be accommodated in a guesthouse at Chitkul. All accommodation units throughout the trip, including the Swiss tents, will come with attached washrooms. Today's meal package includes breakfast and dinner only. Overnight in a guesthouse at Nako. Ride from Chitkul to Nako. You'll be accommodated in a guesthouse at Nako. Today's meal package includes breakfast and dinner only. On all days, you'll halt at a restaurant or eatery en route to your destination where you can have lunch at your own expense. Overnight in a hotel at Kaza. Ride from Nako to Kaza. You'll be accommodated in a hotel at Kaza. All accommodation will be on twin-sharing basis, with two travellers sharing a room or a Swiss tent. Today's meal package includes breakfast and dinner only. Spend the day at Kaza. A support vehicle driven by a mechanic will follow your entourage throughout the trip. You'll be accommodated in the same hotel at Kaza as yesterday. Today's meal package includes breakfast and dinner only. Overnight in Swiss tents at Chandratal Lake. Ride from Kaza to Chandratal Lake. A road captain riding on a motorbike will lead your entourage throughout the trip. You'll be accommodated in Swiss tents at Chandratal Lake. Today's meal package includes breakfast and dinner only. Ride from Chandratal Lake to Jispa. You'll be accommodated in a hotel at Jispa. Today's meal package includes breakfast and dinner only. Please note that non-vegetarian food may not always be available everywhere. Ride from Jispa to Leh. You may be issued an Ladakh-registered motorbike of the same model and make for riding in Jammu and Kashmir due to local union issues. You'll be accommodated in a hotel at Leh. Today's meal package includes breakfast and dinner only. Spend the day at Leh. Please follow proper acclimatization measures, as instructed by your road captain, to avoid suffering from acute mountain sickness at higher altitudes. You'll be accommodated in the same hotel at Leh as yesterday. Today's meal package includes breakfast and dinner only. Overnight in Swiss tents or a hotel at Hunder. Ride from Leh to Hunder. You'll be accommodated in a hotel or Swiss tents at Hunder. Today's meal package includes breakfast and dinner only. Please note that due to the high-altitude, there may be limited road access and availability of services like cellular network or bank ATMs. Ride from Hunder to Pangong Lake. You'll be accommodated in Swiss tents at Pangong Lake. Today's meal package includes breakfast and dinner only. Entry tickets to local attractions, such as the monasteries and landmarks, are not included in the package and are payable on the spot. Ride from Pangong Lake to Leh. You'll be accommodated in Swiss tents at Pangong Lake. Today's meal package includes breakfast and dinner only. At the end of the tour, you'll receive all group photos taken by the road captain. Overnight in a hotel at Kargil. Ride from Leh to Kargil. You'll be accommodated in a hotel at Kargil. Today's meal package includes breakfast and dinner only. Overnight in a hotel at Srinagar. Ride from Kargil to Srinagar. You'll be accommodated in a hotel at Srinagar. Today's meal package includes breakfast and dinner only. Overnight in a hotel at Pathankot. Ride from Srinagar to Pathankot. You'll be accommodated in a hotel at Pathankot. Today's meal package includes breakfast and dinner only. Ride from Pathankot to Delhi. Today's meal package includes breakfast only. You'll return the motorbikes and helmets back to the tour operator here. You can proceed to your next destination from Delhi's Indira Gandhi International Airport. There is no pick-up for this Spiti and Ladakh motorbiking trip. You begin motorbiking from Delhi itself. Delhi is easily accessible by road, rail or air, from most domestic and international hubs. You can board a direct flight to Delhi's Indira Gandhi International Airport from most major cities in India. The exact meeting point in Delhi will be communicated after confirmation of the booking.